The carcass of an adult male grizzly bear hit and killed by a car last spring near St. Ignatius is now being used to help teach the public about bears. Dale Manning is the professional taxidermist who transformed the animal’s remains into a tool that will now be used to teach the public about bear avoidance techniques and the characteristics that differentiate grizzlies from black bears. The bear will be part of a bear avoidance educational trailer that will be used around Northern Idaho, Central Washington and Western Montana. That trailer and accompanying educational material were created by the “Be Bear Aware Campaign”, a national program designed to educate the public about being safe in bear country. In tonight’s feature story, Chuck Bartlebaugh of the “Be Bear Aware Campaign.” and Fish Wildlife and Parks bear manager, Jamie Jonkel share their thoughts about bear safety. 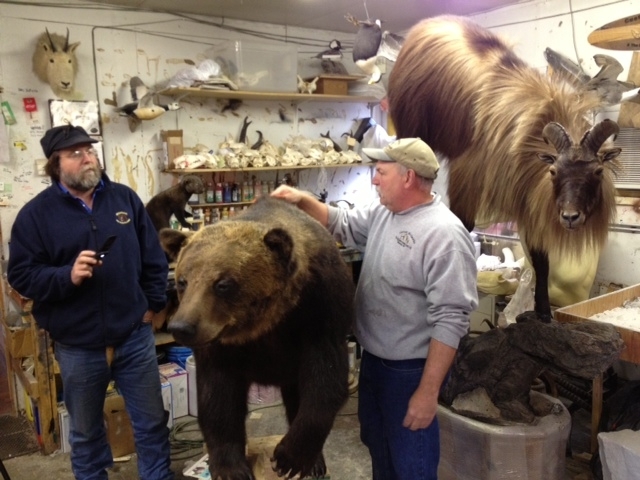 First, Edward O’Brien speaks with the artistic force behind the grizzly mount – taxidermist Dale Manning.